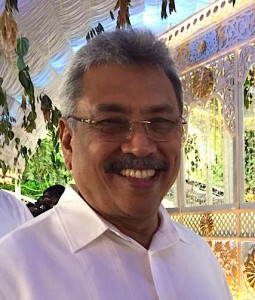 Former defence secretary Gotabaya Rajapaksa today declared that it was time to end this tyrant regime which came into power in the guise of ‘yahapalanaya’ and restore peace Mahinda Rajapaksa brought to Sri Lanka. “This yahapalanaya regime is much worst than of even Hitler’s rule,” he told news reporters outside the Kaduwela Magistrate Court soon after his nephew, Yoshitha Rajapaksa, along with four others were remanded for allegedly committing financial irregularities at the Carlton Sports Network (CSN). Rajapaksa went on to say that the arrest was an act of revenge by the current administration led by President Maithripala Sirisena and Prime Minister Ranil Wickremesinghe. “This is what they have been trying to do for the past one year since coming into power, but taking revenge from a child is wrong,” he said. Rajapaksa added that during the war it was difficult to enlist youth to fight against the LTTE, and then he had personally spoken to Mahinda Rajapaksa and his wife, Shiranthi and requested them to release a son. “I asked them to give me one of their sons so that it can be a boost for other families, and today that child who came to fight the war has been arrested,” he said. no one understand what is going on here. there was a huge foreign force backed UNP and MR to come to the power. neighboring nation doesn’t like to have a powerful leader in our country. Sri lanka is popular as majority of Sinhalese Buddhist. they want to destroy the root of our country through the current leaders. So, same time they want to destroy new party is formed. The solution is to pressurized mahinda by arresting his family members. if you can’t think the root it is pathetic. If you followed lanken issues until 8th January 2015, you would not have said this way. Or you should be one another fool that would behave so indifferent not respecting the basics. Else, those who have brains the size of a needle head would NOT have asked the question why Rajapakshes are being hated by the masses today. Samuel, you should be more specific and say that the Rajapaksas are hated by the ‘Colombians’. The Rajapaksa family is still beloved by the masses. Why do you think 5.4 million of them cast their votes for Mahinda Rajapaksa? Don’t confuse the Elite Colombians with the masses. Two different demographic populations. The masses you mention are the gullible public who cannot see beyond their noses. Mahinda was the man who attempted to steal away the Tsunami funds. These people still voted him without any clue how much this rogue tried to steal what is really the victims of the disaster. Unfortunately many people in Sri Lanka are so uneducated and not intelligent and can be easily taken for a big ride. (“attempted to steal”) ???. Wrong! please replace with stole or ran away. Mahinda Rajavassa when he was a student at Ananda College stayed next to the student bathroom and charged forcefully money when students used the bathroom. He got kicked out from ananda college and ultimately he ended up in thurstan. You hit the nail on the head ! These people are brainwashed by the MR’s corrupt regime. They will only see what their brainwashed minds are prepared to see. May I ask you from what end you are talking please ? During the days of Maharaja – Ranil was attacked as no other. Kelaniya Mervin was using all filthy langauge to attacked Ranil, CBK or any others that stood against the rascals. But today, not Ranil, CBK or others but POLICE together with its commission react accordingly. Is that not similar to what one sees in the Europe ? I mean not in Belarus (a friendly nation of Maharaja) but western Europe ? Gota has no brain cells left – so what comes from his cesspit will have no value. Else he would not have added the term TYRANNY. Or may be the bugger does not know hat that mean. 1. Unjust or oppressive governmental power: “He tended to see the Crown as the benign center of the empire and Parliament as the malevolent source of tyranny” (Gordon S. Wood). 2. A government in which a single ruler is vested with absolute power: people liberated from a brutal tyranny. 3. The office, authority, or jurisdiction of an absolute ruler: Pisistratus held the tyranny of Athens. a. The oppressive or unjust use of power: parental tyranny. b. A tyrannical act: refused to submit to her husband’s tyrannies. 5. An oppressive or harshly limiting condition: the tyranny of social expectations. Let me correct you here- noone among us gullible folks that would do anything and everything to please Rajapakshe idiots would not understand this even today. What a pathetic way of thinking? Do you have proof ? Who wanted to remove good leaders in the world? But many would like to see bad ones removed. There may be likes and dislikes. But what you say here is nonsense. Aney Sama, You are like Rip Van Winkle! When did you awake from your slumber? The Rajapakse family has ruined Sri Lanka and her fair reputation. Gotabaya Rajapakse was a TYRANT now shedding tears. The family rejected by the people must at least now stop dividing the country. Mahinda we know you are fool. Dont you understand that you are being used by manipulative elements to save their hide? Retire at least now with whatever remaining grace. All in all this is a joke. Having robbed the country bare, the family now want the people to bail them out!! Ado Hoooooo! Btw, In Jan 2015 it was 5.8 million, In Aug it was less than 5 million Now it will be NO million – Let then stew in their own dirty brew. “This can not be seen where they come from capital, for it seems clear that the use of black money to make white, various projects have been made to bring these into the country, it’s a serious mistake,” he said. Prof. Sarath Wijesuriya said, Yoshitha has acted contrary to the law several occasions while being in thethe Navy. “He has travelled abroad 74 times. But the Navy’s permission to take 33 times, which they see how superficial being above law,” said Professor Sarath Wijesuriya. Sama, this post of yours is indeed quite pathetic! Prior to posting your comments, please learn the language! There cannot be any tyranny worse than what the people of Sri Lanka went through under you Gota and your brother MR supported by his sons. All of you should be put in one cell in the jail sharing the hira bath from the same plate. The prison cell should be named Rajapakse Cell and preserved for the coming generations to see. Gota completed a Masters degree in India and the Colombo Uni awarded him Doctor of Letters (Honoris Causa). A Master’s Degree in What subject, May I ask? Mr. Rajapaksa had his education at Ananda College, Colombo, Sri Lanka’s premier Buddhist school. He completed his basic officer cadet training at the prestigious Military Academy at Diyatalawa, and subsequently completed the Young Officers Course at Rawalpindi and the Mid-Career Course at Quetta, Pakistan. He completed his Staff Course at the Defence Services Staff College in Wellington, India, in 1983, and obtained his Masters Degree in Defence Studies from the University of Madras in the same year. He underwent advanced training in Counter Insurgency and Jungle Warfare at Assam, India, and graduated in Advanced Infantry Training from the Infantry School at Fort Benning, USA later in his career. Following his successful career in the Sri Lanka Army, Mr. Rajapaksa obtained a Masters Degree in Information Technology from the University of Colombo. He subsequently worked as the Unix System Administrator of the prestigious Loyola Law School in Los Angeles, California, prior to returning to Sri Lanka to take up his appointment as the Secretary to the Ministry of Defence. If this true it should be stated in the public forum. HOw come any candidate to earn Master s Degree without having the basic degree (BA, BSc, Bcom or the like) completed ? As my information was concerned, Gota Rajapakshe had been exil in the states for 15 years or so running away after the late 80 killing insurgency issues were erupted. Why am I getting thumbs down for stating a fact? Native – here’s something on “Rajapaksa Dynasty And Their Education Qualification Saga” that could be enlightening, although it doesn’t include Gota’s authentic educational stats. I am aware of this article and it contents. As regard to his MSc at a Uni in South India, the information was available on internet which I thought at the time was not part of Gota’s PR machine. For me education or lack of it does not make much difference. Education should drive a person to wisdom, compassion, peace, generosity, ………… mere number crunching, learning information by heart, and talking bull are good if you want to live in a greed driven society, but not good for the people nor for the country. Native – thank goodness we are in absolute agreement with regard to your view on “education”!! Aahh Native… You are well informed of the Gotas qualifications, and guess you are certain he worked for them to…??? Sorry for being ignorant, but could you enlighten us… Where did the Gota get his degrees in being an a..hole and ‘white-vanning’??? Renu, what do you think the Grama Sevaka Niladari Sirsena’s education level is? Not withstanding the ‘Bragate’ incident, anything that comes out of his mouth is quite foolish. That’s why he stays silent on most matters because he knows that he is not a learned man and he comes out with the most unintelligent words a President of a country can utter. With regards to MY3’s educational qualifications , most probably he may have just SSC (O/L) , to his credit , he never claimed to be an academic or a P.hD holder . in fact , he publicly admitted that he is not a “Mahaccharya or Acchraya ” but a just “Goviya” what’s wrong with it ? we admire his honesty and simplicity , whereas our Mafia king ?? Mafia king is supposed to be a LOwyer with a matching P.hD , we all know how got admission to the law college and subsequent cheating , as name implies he is a born crook ; thus, he deserves nothing but a life sentence . guess what ? we are eagerly waiting to see that whole Rajapaksa family ending up behind bars , every single member of his family deserves life sentence , nothing less would be acceptable to us . Let me greet you for the new year 2016 – long time did not see you here nor have I had the chance to read your valuable comments. Please add your thoughts (summary) about the current situation in the country. Do you think arresting Yohsita is a political revenge on them ? You are right here – as always, we the ones waiting MAFIA king et al to be convicted – oneday soon. Jaya niyathai. Thank you , belated greetings for you as well my friend.sorry i couldn’t keep up with the CT as before , as i hardly find any spare time to do the typing ; nevertheless, whenever i get a chance , i do chip in here and there. As to your first question , we are in a transition period , things are not being done in the pace which we would like to see ;nonetheless, we are moving in the right direction . hopefully , proposed constitutional changes would come out and eventually they would be implemented. financially , we are sitting on a volcano , don’t know when it would explode , thanks to Mafia king , we are facing a balance of payment crisis. As to Yoshitha’s arrest , he should have been arrested and locked up long time ago , he has committed multiple crimes while in uniform , he must be dismissed from the navy and the same time punishment must be meted out to those who recruited him , he didn’t have basic entry qualifications to be a naval officer in the first place , that karannagoda stooge must be held responsible for the entire process. Yoshitha had been involved in business while in Navy , that alone warrants an immediate dismissal , don’t know why it takes so long to take firm decisions on them. As i said , every single member of the Mafia family member ought to be behind bars , there are no two words about it , every single member of the family is directly or indirectly connected to multiple murder cases. only exception is the youngest off spring (Rocket Rohitha) , Rohitha’s so called rocket launch , who was that mystery donor that volunteered to spend US 200 odd Milloin dollars ? whose money was it ? Sapumal , will wait and see how the drama going to be unfolded , one thing is for sure , no more Rajapakses going to lead SL ever again. That should be the interpretation of MR supporters. Now we are becoming clear even former president was not informed enough about the law and order. How could his offsprings know how to respect the laws. Telling the gullible like you somethign and doing the other way around go on kissing Mahabodhi he abused the nation. No doubt, you the like would go on get caught by such tricks, you are the majority in this country – westerners would laugh at us the manner, why highly literate srilankens further allow idiots to get elected as their politicians. For me from the day 1 Rajapakshe was like a square peg on a round hole. CBK failed to do her job since these radical thought bearers blocked her. Else, I even today respect Devolution of Power into region (Federalism) as we enjoy in Germany, Switzerland and any other civlized world. Even on the west, there are people that would become shock just hearing ” go and see Psychologist” – it is just because they have no sufficient knowledge to differentiate the role of a psychologist to Psychiatric doctor. Very same manner, federalism is being misinterpreted in fools dominated srilanka. As PM lately expressed, we need to market it to the people in their langague – to the north in a different manner than to a south. That is fully right. That is why I believe, PM of the day is most senior politician that entire world not only lanken minority educated folks would have to respect. Be patient Renu, a decent and a fearless ‘Vel Widane’ is going to be in charge of ‘Law and Order’ of ‘ Serendip’ soon. Renu what is the standard of education you have? we would love to hear about your qualifications. AN EDUCATED PERSON WOULD NEVER RIDICULE ANOTHER ABOUT THEIR EDUCATION. Your comment speaks a lot about yourself. What has education got to do with wisdom? Education or lack of it does not make much difference. Education should drive a person to wisdom, compassion, peace, generosity, ………… mere number crunching, learning information by heart, and talking bull are good if you want to live in a greed driven society, but not good for the people nor for the country. Yoshitha never went to war! lol… If so he should have been in the front lines with the actual military..
See who is talking of tyranny ???? Gotha’s standard of education will not give him a chance of understanding the Law of our Country , he is a mass murderer, his satisfaction is in killing, abducting, white vaning & all inhuman methords to make our people suffer, very soon he will be arrested & put in Prison. Interesting -Got a baya stating that this Governement is worst than Hitler’s Government. One thing is certain though – that this Government is much better than the Rajapakse Government – Gotabaya, Basil & Mahinda. What about all those onocent lives that you ended because of your arrogance. That also in two occasions. 1st in matale then you ran away to the USA. 2nd in 2009 in Vanni.inbetween you killed thousands more with white vans and your thugs. This time you have no place to run. There is a widespread opinion that Ranil Wikramasingha, prime minister given promise to Mahinda family to protect them from all murderous activities. Arresting Yoshitha in money laundering, while he has criminal charge on murder is a good start to protect him. If that is the case PM is betraying the hope of people of Sri Lanka. your kind of lies will live short… anyways the kind of rumours will have no ground in today s srilanka anymore. good luck. PM is not a buruwek as your Rajapakpshes… can this ever be possible with JVP and TNA sitting on the opo.. never. Plese dont spread gossips the kind of next door fence. Good luck and get a life. One man’s tyrant is another man’s freedom fighter. But to call the current regime worse than Hitler’s rule (regime) must have been difficult, especially after having tried so hard to out do Hutler when he was SoD. The same applies to the man Sarath Fonseka who was a war hero and to arrest him , no one will ever approve this. This is what Gotabaya did to such a war hero. That was clear case of revenge for contesting for the Presidency after his retirement. Certainly Sarath Fonseka has a right to contest like any citizen of this country and he has not done any crime by contesting. But if Either Gotabaya or Mahinda Rajapakse say both are different; winning the war and being a war hero is different and committing offence of getting involved in politics while as a Commander is different and not a witch hunt then same too applies to Yoshitha. What makes Yoshitha above the law and it too cannot be construed as a revenge and a witch hunt. Why does not Gotabaya and Mahinda Rakapakse come out in the public and not merely making statements, let him also face questions by the public and answer them. He is merely abusing the media to tell his own lopsided version and media should refuse to film him without allowing public to question him. I am keen to know what the Rajapakses have to say about their part of revenge on many people including Sarath Fonseka, Shirani Bandaranayke when they were in power. They are real cowards. Sad to say as long as there are enough gullible public such people will survive. It is going to be certain downfall to the Rajapakses. Unless they accept their side of faults at least to their conscience they will always blame others for the faults which is squarely theirs and it will be a time when they will not be able to recover and the noose of the law will certainly and surely tighten around their necks. It is then not worth regretting. The uneducated filth think they did no wrong? I am astonished this tyrant Gotabhaya can keep a straight face and still say “We must end this and restore the peace that we once had.” He and his cohorts probably had peace with the fortune they pilfered from our meagre resources but the country was forced to go cap in hand for aids and handouts and trade concessions from the West he seems to detest so much (yet hangs on to his US Citizenship). You must read history books of the world before you comment.I don’t say Rajapaksa’s are right.But he was the man for this period to Sri lanka.You can have an idea just looking current situation of the world. Sri Lanka now a ship without a crew. Charly01. Even Robin Hood had his followers but he robbed the rich and gave the loot to the poor. This lot of Rajapakses robbed their country and fellow countrymen and kept the loot for themselves. Do you really think they made massive fortunes and able to buy up mansions in USA and Walawes in Sri Lanka solely with their ministerial salaries? I remember just from UK alone there was a donation of more than £24 million to help the tsunami victims in 2004 but most of them are still languishing in tents. There were more from other countries and nobody knows what happened to the monies. The Rajapakses were a law unto themselves buying and selling major procurements with impunity to fictitious companies. Thankfully the elections intervened as Gotabhaya decreed that he or his cohorts should be interviewing Dual Citizenship applicants to assess suitability. What was its purpose other than to collect another line of bribes. He is late on the news. We did that in January of last year. Was he just counting money for over a year without reading the news? Whole family a bunch of liars and thieves. Psychiatric mental patients who love to rob public wealth. The man is lucky very lucky that he gave up his US citizenship, otherwise he would have had to sit on the ” Gini Putuwa” as stated by him in his own words. Despite his education he is just another bully, thug, and a——e. He would have done well, very well in Hitler’s SS or Stalin’s NKVD. People like this forget that “the mill of God grinds slowly but surely.” Even the North Koreans are more refined than him. This Gotabaya, who once ran amok with thuggery and other means of kidnapping, Murder,the worst Tyrant in history,during his brothers regime, now wants to come back to power and suppress all law abiding people of Mother Lanka. 1. you should never send me to the North to fight the terrorists. 2. I love the crisp white shirts given by the Navy and i will be a poster boy for the Navy Recruitment Center. 3. I also like to get a diploma from UK, so i can tell people i have a brain. Please make sure i enter the Britannia Royal Naval College, although i will never pass the entrance exams. 4. All other innocent recruits of the Navy can serve at the war front and get killed. It is obvious, any mother will send their sons to serve the Navy if such privileges were offered to them as well , right? So your brother and sister-in-law never really sacrificed anything by sending their son to serve in the Navy. happy to see people speaking about children. what happened to prabhakarans child. Gota is developing amnesaia since they lost the power and money making. After 02 weeks of joing Navy he was sent abroad for training…. and what service yoshitha did to save the country abroad, he ran away like uncle gota.. thats it. MR government never cared about law and order and protected all politicians knowing that they are looting,, how dome a chain snatching man finally owns billion worth of property. You will have to think several times if you are going to throw stones at him ‘They’ spared their lives to give life to us all the sinhalese,tamils,muslisms all of us …do not forget that….If you forget that you are one of the mass murderer so called ‘BUTCHERs ‘ associates ……do not forget that…..Common People did not change the earlier government ,it was for some extremist,Racialists votes from the North and East…. That made the change…….But these people one day will realize the blunder they did by changing the government … Who got them released from brutal terrorism. …SO AS HON.Mr.GOTABHAYA HAS PREDICTED people will also realize soon that it is High time to End this Tyrant Regime and bring back peace to all of us.IF WE ANALYZE IN GOOD FAITH WE ALL FEEL THE DIFFERENCE NOW ….THIS IS ENOUGH—MAY GOD BLESS YOU ALL!